Start Fresh is new in the Windows 10 Anniversary update, build 1607. Start Fresh, like Reset, has two options: Keep My Files, and Remove Everything. There are two big differences between Start Fresh and the built-in Reset. First, Start Fresh isn’t built into Windows 10; it runs from a web page that Microsoft can update frequently. 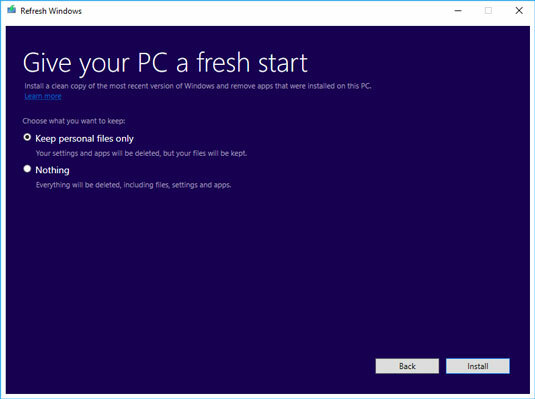 Second, Start Fresh is based on a blissfully clean, Microsoft-endorsed copy of Windows 10. No crapware in sight. If the thought of losing factory-installed drivers doesn’t phase you (typically, a quick run through Windows Update will get them all re-installed), and the thought of getting rid of all the manufacturer-installed junk thrills you, the Start Fresh option is for you. Click or tap the Start icon, the Settings icon, and Update & Security. On the left, choose Recovery. You see the Recovery options. At the bottom, click the link under More Recovery Options to go to the Start Fresh website (which may change from time to time). Download the Start Fresh tool and run it by double-clicking it. Microsoft shows you an End User License Agreement. Read all 3,141 pages of the EULA, call your lawyer, and click Agree. Start Fresh displays the dialog box shown here. The cleanup options in Start Fresh are similar to those in Refresh. If you want to keep your files, select Keep Personal Files Only and then click Install. The files will be kept in the User folder, and in the root of the C: drive. Start Fresh proceeds much like a Reset with Keep My Files, except it uses a clean copy of Win10. If you don’t want to keep anything, select Nothing and then click Install. Again, Start Fresh proceeds as in a Reset with Remove Everything, except it’s done with a clean copy of Windows 10. You are not given the option of reformatting your hard drive. In either case, when you click Install, the installer does exactly that. You don’t have a chance to say “oops.” If you’re caught in the middle of a reset and don’t want it — and you see this admonition in time — you can X out of the installation dialog and choose to halt. No doubt Microsoft will tweak the Start Fresh utility from time to time. As it isn’t part of Windows 10 itself, MS has much greater leeway for making changes.